The Carnival Season is a holiday period during the two weeks before the traditional Christian fasting of Lent. The name comes from the Italian 'carnevale', derived from the Latin carnem (meat) and vale (farewell), hence "farewell to meat" or "farewell to the flesh", letting go of the bodily self. But the origin of Carnevale is older than Christianity, and dates back to Roman time Saturnalia, Saturn's festival, a sort of spring festival characterized by wanton behavior. This spirit of celebration has been transmitted to the Carnival. Carnival in Verona dates back to 1531 and is one of the oldest in Italy. That year, due to a food shortage grain prices rose, poor people, especially in the old St Zeno's area, one of the biggest and more crowded in town, were facing starvation. Tommaso Da Vico, a wealthy noble, decided to donate a huge sum for poor people to buy flour to make gnocchi, small dumplings that at that time were poor people main sustenance. In his will Da Vico ordered to distribute every year, on carnival last friday, gnocchi and wine to people of St Zeno's area. That's how Veronese Carnival had its origin. 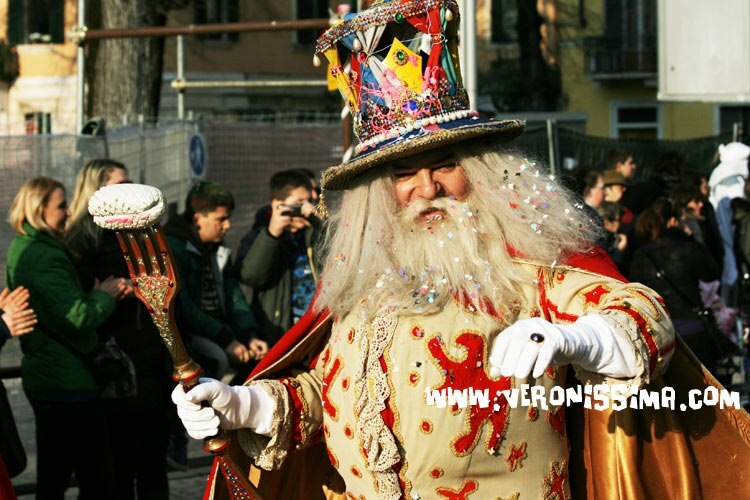 Nowadays, on carnival last friday, called Venerdi' gnocolar', gnocchi's friday, a big parade ending in front of St. Zeno church rides the streets of Verona. The parade is led by Papa' de' gnocco, gnocchi's dad, a mask representing an old king holding, instead of a scepter, a huge fork topped by a big gnocchi. The man who wears the costume is publicly elected in St. Zeno square a month before carnival. Candidates try to buy people's vote offering gnocchi and wine! Verona is just one hour and a half by train from Venice. A very frequent service links the two cities. During carnival period is hard to find a place to stay in the overcrowded Venice. Verona might become a more convenient and less expensive option to visit Venice in that period. Venice has always been a weird place; traditionally people were allowed to wear masks betweenSt. Stephen's Day, December 26, and midnight of Shrove Tuesday. As masks were also allowed during Ascension and from October 5 to Christmas, people could spend a large proportion of the year in disguise. Mask makers (mascareri) enjoyed a special position in society, with their own laws and guild. Masks for Kubrick's eyes wide shut, have been made by a Venetian craftsman pursuing the old tradition. 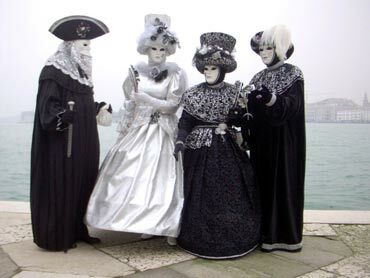 During Carnival period, Venice is crowded by people wearing bizarre and colorful masks and dresses. At night wonderful party are held in many old Venetian palaces. You can rent a costume in specialized shops and dive yourself in the dream like atmosphere... With a bit of advance and luck, you can even get an invitation for a party! This page contains information about Verona Opera Festival. Although we put our best effort in the accuracy of the content, the information reported is not travel and tourism advice, and should not be treated as such. When planning your journey you must not rely on the information on this page as an alternative to travel advice from an appropriately qualified professional. www.veronissima.com and anyone involved in the editing of content on www.veronissima.com will not be liable in repect of any delays, losses, damages and any other adverse consequences arising from or in conncetion with information contained in www.veronissima.com.